Are you looking for a delicious fruit recipe with a difference? If you are, you’ve found it! 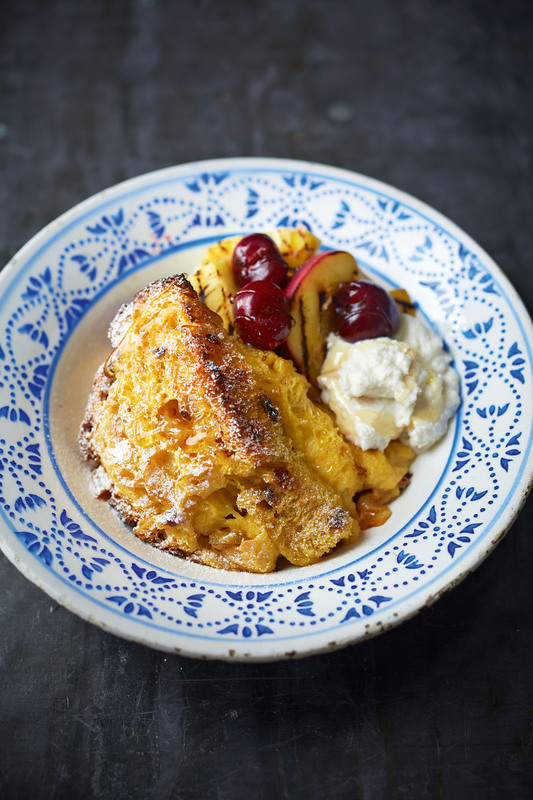 Here’s my panettone & honey pudding with chargrilled fruits & ricotta for you to enjoy. 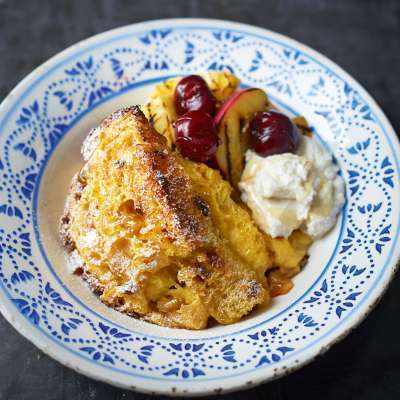 Feast your eyes on the finest panettone & honey pudding with chargrilled fruits & ricotta! It’s straightforward and fun to make this great dish. Simply follow the instructions below and get the perfect result. Preheat the oven to 160°C/gas mark 3. Lightly drizzle the honey over both sides of the panettone. Arrange the slices in a baking dish or shallow casserole, about 26 x 26cm. Place the eggs, egg yolks, caster sugar, vanilla and Marsala in a large bowl. Whisk using a balloon whisk until pale. Gently whisk in the double cream and milk. Pour the egg mixture over the panettone, pushing it down to soak up as much liquid as possible. Sprinkle over the demerara sugar. Bake for 20 minutes or until the top is lightly browned and the custard is just set. Meanwhile, preheat a cast-iron char-grill pan over a high heat for 5–10 minutes. Once hot, lay the pineapple and peaches in the pan and cook for about 1–2 minutes each side (depending on the ripeness of the fruit) or until just softened and with char-grill markings. Remove the pan from the heat and toss in the cherries, leaving them to warm through in the residual heat. Put the ricotta, honey and a few drops of vanilla extract (if using) in a medium bowl and stir to combine. Serve the pudding with a large spoonful of the sweetened ricotta and char-grilled fruit and a dusting of icing sugar. Drizzle with a little extra honey. 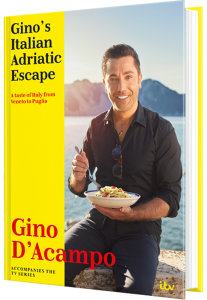 Once you’re done, simply sit back and enjoy your panettone & honey pudding with chargrilled fruits & ricotta and don’t forget to check out other great authentic Italian recipes including great antipasti recipes, Italian pasta recipes, Italian soup recipes, Italian beef dishes and authentic pizza recipes.